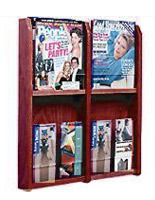 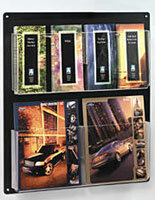 This 6 pocket leaflet display looks upscale for a professional office, but is very affordable! 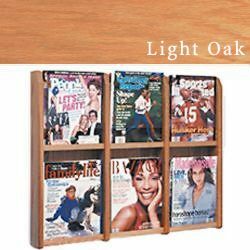 This wooden and plastic stand stores a plethora of magazines on a wall, leaving floor and counters open for other business accessories. 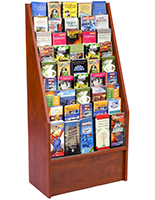 This 6 pocket leaflet display, also known as literature racks, is perfect in a hotel lobby or hospital reception area so people will have something to read while they wait! 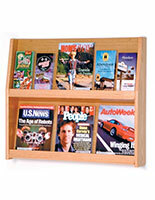 This plastic and wood holder for pamphlets is a great way to sort, organize and dispense information. 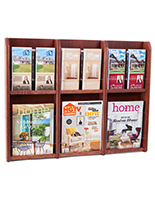 This 6 pocket leaflet display, such as a paper sorter, adjusts with peg dividers for variously sized magazines and trifolds.